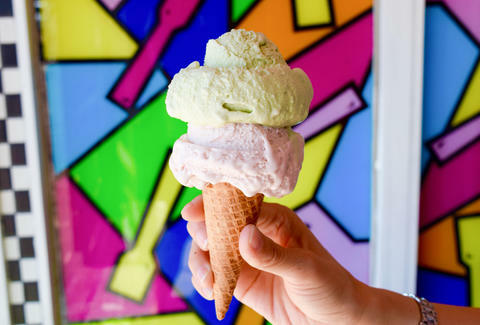 These days you can throw a waffle cone in nearly every direction around LA and hit a newly opened artisanal ice cream shop dishing out wacky flavors. We shudder to remember, but there was a time not long ago when creative flavors beyond the typical classics were hard to come by. It was a dark time. Sure, there were a few old-school spots like Mashti Malone’s with its rosewater and saffron, or Helados Pops with its sapote and horchata. But otherwise, you were mostly stuck deciding between mint chocolate chip or rocky road. But then on April 9th, 2005, owner Tai Kim opened up Scoops on a quiet strip of Heliotrope just off Melrose, and in a short time began blowing minds with creative and unusual flavors like cheesecake with dill, chocolate wasabi, and the now-famous brown bread (actually made with Grape Nuts and caramel). Kim didn’t start off in kitchens, though: as a CalArts grad in studio art, Kim had found himself drawn to food as a new artistic medium. While attending Western Culinary Institute (now Cordon Bleu) in Portland, he zeroed in on his calling while taking an ice cream and cheese making class. After graduating, Kim taught at the culinary school, but was surprised to discover that many of his aspiring chef-students weren’t particularly interested in trying new things or expanding their palate with international cuisines. And that’s when Kim realized that an ice cream shop would be the perfect vehicle for introducing people to new and unfamiliar flavors. Initially a one-man operation, Kim hand-made and scooped all of the ice cream, gelato, and sorbet himself, experimenting with new flavor combinations like a mad scientist. In the spirit of discovery and education, Kim was always happy to let guests try out flavors before committing to a scoop. He quickly amassed a roster of hundreds of unique flavors which quickly rotated through the 18 bins of his display case. The buzz quickly spread, and Kim soon found himself flooded with new customers in search of his clever combinations like Jim Beam with mint, lavender coconut, and avocado with banana. One of the dedicated customers from those early years was Matt Kang, currently the editor at Eater LA and a longtime LA food blogger. 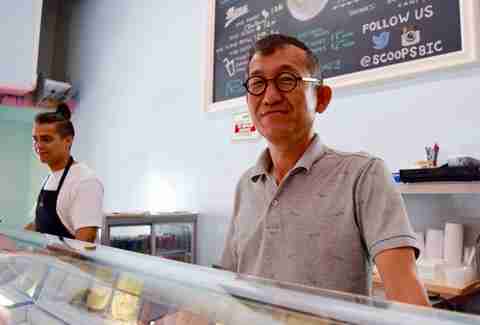 After frequent visits to the shop, Kang and Kim struck up a friendship, and Kim became a culinary mentor to Kang, introducing him to new dishes around LA and discussing how they could be translated into ice cream. After a few years, Kang ultimately decided to leave his gig as a commercial bank analyst to dedicate himself more fully to exploring food. 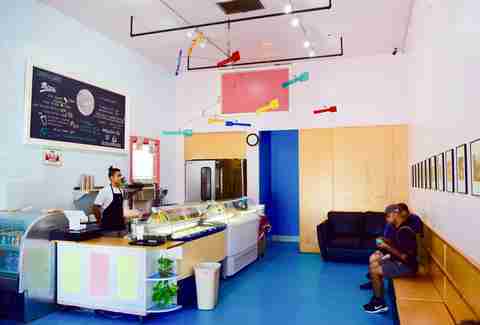 Then in December of 2010, after working closely with Kim to learn about running an ice cream shop, Kang opened Scoops’ second outpost on Overland Ave in Palms. For the new location, Kang utilized ice cream made by Kim and added a coffee program, but otherwise kept to the no-frills spirit of the original Scoops. 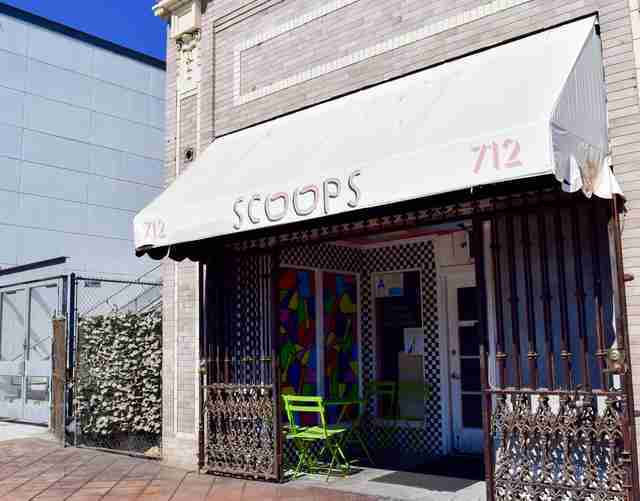 Scoops continued to pick up momentum, gathering more fans, experimenting with more flavors, and expanding to more locations, including a flavor lab in Highland Park, a spot in the ultra-hot Far East Plaza in Chinatown, and its first shop in Orange County. 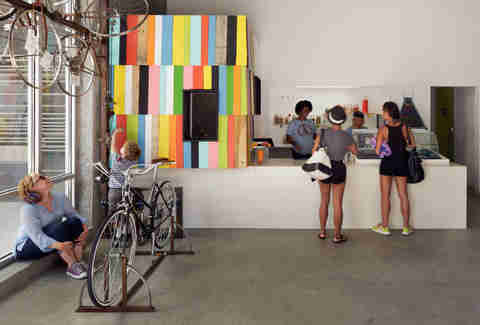 As the Scoops footprint has continued to spread over the years, so has the shop’s impact on artisanal ice cream in LA. 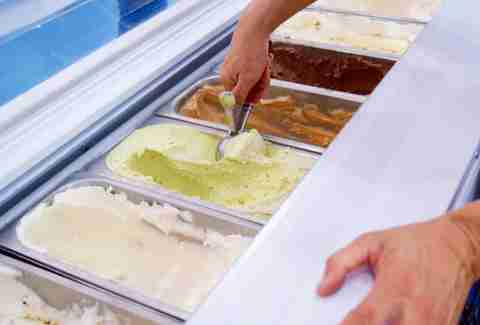 As Scoops has grown to be a popular mainstay, delighting and challenging the palates of ice cream fans, it's helped to create a welcome environment and adventurous customer base for newcomer shops, many of whom, like Scoops, focus on fresh ingredients and creative flavor combos. “I’m sure when I started there was probably some other places doing new things, but for some reason we were the one that stood out,” Kim says, humbly. 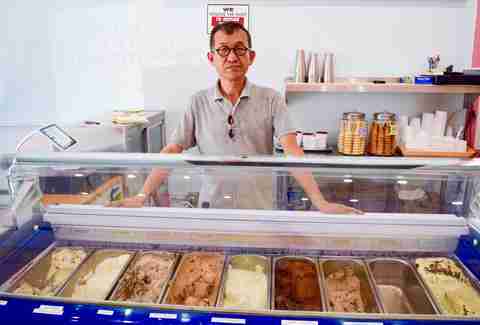 With the recent dramatic rise in the number of artisanal ice cream shops in LA -- both homegrown and imports from other cities -- it also seems that long-established national brands are feeling the pressure to stay relevant. A quick perusal of Yelp reveals that over the past six years, at least six Häagen-Dazs have closed locally, along with 10 Baskin-Robbins, and several Ben & Jerry’s locations. But that doesn’t mean they’re throwing in the towel. Baskin-Robbins, which started over 70 years ago in Glendale with the hook of offering 31 flavors -- one for every day of the month -- and has recently ventured into more creative flavors, like Ancho Mango Sunrise and Oreo Milk & Cereal -- both similar to flavors you’d find at artisanal slingers. They’re also revamping many of their 230 locations across the county, and just launched their own app. “We’re really focused on continuing to push the envelope with new ice cream flavors and frozen desserts,” explains Weldon Spangler, senior vice president of Baskin-Robbins US and Canada. Indeed, thanks in huge part to Kim, it is. Danny Jensen is a regular Thrillist contributor who will gladly eat a cone of Scoops' Brown Butter any day. Follow his ice cream dreams on Twitter and Instagram.